​even if we have to ​dig a little to find it." Dora Henderson is a Licensed Mental Health Counselor and Registered Play Therapist. She has specialties in Sand Tray Therapy as well as EMDR. Dora is a mother of three young adults and has been married for 30 years. She is also a Mental Health Counselor for the Orange County Public School district in Orlando, Florida. Dora's passion is working with both children and adults, and encouragingly stands by her client's side as they make their way through their healing journey one step at a time. ​Dora received her Master’s degree in Counseling from Webster University, graduating with honors. She continued her education by receiving specialized training in Play Therapy from The University of Central Florida. She has obtained her Registered Play Therapist Certificate through the AFPT board of Play Therapists. Dora has also had additional training in Sand Tray therapy from the Playful Learning Institute where she has completed training in level 1 through level 8, and is continuing to work on completing all 10 levels of this advanced training. Recently, she completed her training in EMDR from an EMDRIA trained professional. ​In 2017, Dora became an LMHC Qualified Supervisor and Registered Play Therapist Supervisor (RPT-S). Dora is a certified Youth Mental Health First Aid Trainer. Mental Health First Aid (YMHFA) training is a great resource for anyone who works with youth as it allows people to learn specific skills that are important during a mental health crisis. For more information on YMHFA click here. ​In 2019, Dora proudly became a Certified Clinical Trauma Professional (CCTP). 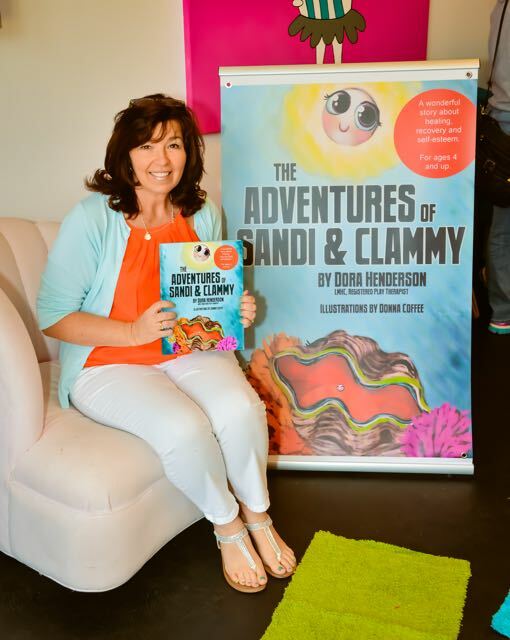 Dora is also the creator and author of The Adventures of Sandi & Clammy. This book came out of seeing several clients with low self-esteem struggle to find any inner peace or happiness within themselves. Within the pages of this healing adventure, children begin to learn and realize that they are each unique and special in their own way. Children also learn some basic CBT techniques (Cognitive Behavioral Therapy) that will help them to gain the ability to increase positive self-talk skills, thus increasing self-regulation and positive self-esteem. To learn more about The Adventures of Sandi & Clammy, please click here. ​Play Therapy is a child-sensitive, developmentally appropriate mental health intervention that helps children heal from traumatic wounding as well as teaching problem-solving skills and how to self-regulate. I believe that play is the primary way that children learn about their world, communicate thoughts and feelings and attempt to work through difficult situations. I am trained in both non-directive and directive play therapy. In non-directive play therapy, I allow the child to lead the play, trusting that the child’s issues will naturally arise in their play. I am trained to interpret the meaning of children’s play and discuss with parents what is at the root of their child’s behavior. I work closely with parents to generate strategies that will help bring resolution to the child’s problems. In directive play therapy, specific activities are selected to teach a child skills or to better understand necessary concepts. I may work with the whole family to engage in activities that will bring understanding to the child’s issues and increase support in the child’s healing. ​I also use play-based activities to foster and increase attachment between parents and children. I provide an array of expressive arts therapies including play, sand tray, art, music and movement. Play therapy can be beneficial to a child who is experiencing problems related to anger, ADHD, death, transitions such as a new move, body image, starting school, birth of a sibling, abandonment, divorce, blended families, self-esteem, potty-training as well as trauma and abuse. “The play therapy process can be viewed as a relationship between the therapist and the child in which the child utilizes play to explore his or her personal world and also to make contact with the therapist in a way that is safe for the child. Play therapy provides an opportunity for children to live out, during play, experiences and associated feelings. This process allows the therapist to experience, in a personal and interactive way, the inner dimensions of the child’s world. This therapeutic relationship is what provides dynamic growth and healing for the child.” (Landreth & Bratton, 2001). Play therapy helps a child feel validated and understood, helping the child to grow in confidence, while feeling safe in the play environment. ​Through the use of sand and miniatures an individual is able to creatively express themselves going to depths deeper than they may even be aware, it's not just for kids, adults too can find healing through the use of sand. Sand Boxes of dry and moist sand are available. Client’s have at their disposal a number of small figures with which they can represent their internal worlds. “Sand Play” is a safe avenue to face inner fears and emotions. The therapist offers the client a “free and protected” space in which to work from. Eye Movement Desensitization and Reprocessing (EMDR) is an integrative approach to healing that has been extensively researched and proven to be an incredibly effective treatment for trauma. EMDR uses a set of standardized protocols that incorporates elements from many different treatment approaches. To date, millions of people of all ages have experienced tremendous healing from EMDR that has helped relieve many types of psychological stress. More times than not, a level of learning occurs during the EMDR process that further increases the level of healing that takes places during sessions. The core of EMDR treatment involves activating (accessing through verbal recall) components of the traumatic memory or disturbing life event and pairing those components with alternating bilateral or dual attention stimulation (back & forth crossing the center eye movement,tapping or alternating audio). This process appears to facilitate the return of normal information processing and integration. This treatment approach may result in alleviation of presenting symptoms, reduced distress related to the memory, improved self-esteem, relief from somatic symptoms, and resolution of present and future anticipated triggers. Though different individuals will have different needs, EMDR results will usually be more rapid than previous forms of therapy. Speed is not the goal though, healing is our main focus. ​For more information on EMDR, click here. It means the damage no longer controls our lives"